The perennial food insecurity threatening sub-Saharan Africa (SSA) warrants sustainable solution. Only 11 countries in Africa have been able to halve the number of hungry people till date. At present, 220 million are still undernourished. Under business-as-usual scenario, experts fear that Africa can meet just 13 per cent of its food needs by 2050. Notably, the continent has increased total food production by 160 per cent in the past two decades. However, per capita food availability has only increased by 12 per cent. The increase in food production comes from land expansion, and by mobilising more labour force with negligible improvement in the productivity of land. Expansion of small-scale cropland and land for permanent agriculture accounts for 60 per cent of forest conversion in the continent. Nearly 65 per cent of Africa’s land is affected by degradation, leading to 3 per cent annual loss in the gross domestic product. It also leads to the loss of 2.8 million hectares of forests annually, according to the New Partnership for Africa's Development (NEPAD) 2016 report. This has led to environmental footprint and disequilibrium, including massive land degradation, desertification, biodiversity loss and carbon dioxide emissions. According to NEPAD’s report, large-scale investment in contract farming in Africa has also reached 20 million hectares in the past 10 years. Land grabbing may cause displacement of farmers and massive land clearance for permanent monoculture agriculture. Whether this translates into more exports or home food security remains doubtful. Regardless, the quest for more land to produce food, coupled with limited opportunities for youth employment, will further pressurise rural dwellers to seek alternative livelihood in forests. A major challenge is how Africa can meet its food requirement without further destroying its forests? This article examines the prospects of addressing the conflict between food production and deforestation through sustainably integrating trees in Africa’s agricultural landscapes. Africa urgently needs food self-sufficiency—food produced locally and for the market. The challenge for policy makers is how to increase agricultural productivity without expanding into forestlands and with minimal use of external inputs. Extra production to meet food requirement by 2050 must necessarily come from land that is already under cultivation. Recent evidence suggests that technology change is a major driver of productivity. However, unless agricultural technologies are sustainable, the pitfalls of conventional industrial-led, monoculture-driven agriculture on the one hand and extensive subsistence farming on the other hand, will be repeated. Unsustainable land management practices resulting in degradation, soil erosion, low soil fertility and sub-optimal use of inputs are the major limitations to agricultural productivity in Africa. The argument against the use of modern technologies and inorganic fertilizers for small-holder farmers is counterproductive and may be tantamount to perpetuating hunger in a continent where the average cereal yield has only improved from 1.2 to 1.6 t ha-1 (tonnes per hectare) from 1993 to 2013. The high yield gap between agronomic potential and actual yields in SSA (76 per cent) compared to 11 per cent in Asia must be turned to advantage. Promoting the use of synthetic fertilizers alone is not feasible either, as Africa struggled to raise its fertilizer use from 8 to 11 kg in the last decade since the Abuja Declaration in 2006. Excessive use of chemical fertilizers and pesticides potentially accentuating greenhouse gas emissions and water pollution must be avoided. Africa needs integrated soil and nutrient management practices and technologies to achieve acceptable level of productivity. This requires optimally combining both organic and inorganic sources, and more efficient use of water, labour and other production inputs. The challenge is more than simply raising the yield: it is to ensure increased food production in a sustainable way. The sustainable food and agriculture approach calls for an integrated approach that creates synergies, minimises trade-offs and lessens the pressure on remaining forestland while sustainably increasing food productivity. It has to be more efficient in the use of inputs while conserving the natural resource base. Africa has lost an estimated 3.4 million hectares of forests annually during 2000 to 2010. The main drivers behind deforestation include agricultural expansion and timber extraction, conversion of forest ecosystems by large-scale plantation forests, permanent commercial tree crops (cocoa and oil palm plantations) and large-scale investment in contract farming. Forest conversion and inappropriate farming practices lead to soil organic matter depletion, disturbance of soil structure, erosion and soil fertility decline. It also leads to reduction in the activity and diversity of soil fauna and nutrients. This may be restored or avoided through agro-ecological processes, particularly by integrating trees, agroforestry and conservation agriculture practices. Despite some progress made in reducing deforestation, less attention has been devoted to increasing tree cover outside forests.The rural dwellers—largely family farmers who are also the custodians of forestlands and resources—can be part of an effective solution to sustainably manage natural resources and integrate trees in agricultural landscapes. Integrating trees in farming systems is not new in Africa. Trees are vital parts of farming and rural landscapes in the continent, but scaling up the practice innovatively is still lacking. There is sufficient evidence that integrating trees in agricultural landscapes through agroforestry systems and trees outside forests, can contribute to food security, climate adaptation and mitigation as well as reverse environmental degradation. Opportunity exists to increase tree cover in agricultural landscapes in Africa using integrated approaches. Scientists have indicated that one-third of African farmers grow trees and majority of farmlands have 12 to 30 per cent tree cover—higher than the global average of 10 per cent. It may even be possible to increase the level of tree cover in Africa. In the context of trees outside forests, various agroforestry systems—tree-crop, tree-livestock, tree-fish configurations such as evergreen agriculture, rotational woodlots, fodder banks, fertilizer trees systems and tree domestication on farms have proved to be important, especially when implemented in an integrated manner to enhance food security, livelihood and ecosystems services. Sustainable agricultural intensification based on low input production systems has a good prospect of integrating trees into agricultural landscapes to achieve synergies, eliminate competition and minimise trade-offs. Currently, African leaders are calling for massive tree planting to restore forest landscapes through a partnership led by NEPAD. It also includes the Food and Agriculture Organization, governments and partners to restore 100 million hectares of Africa’s land by 2030. Similar is the “Green Wall” initiative in the African Sahel. These are steps in the right direction. The success of these integrated systems depends on knowledge intensive support, capacity development, training and quality tree seed supply system for small-holder farmers and an enabling environment, including governance and policies. When trees are integrated in agricultural landscapes appropriately their environmental services can help boost agricultural productivity. The sustainable practice of deliberately planting, managing and conserving trees on farmlands need to be brought to scale in many African countries. Addressing “sustainability” at scale at the “agriculture-forest” interface is a huge challenge that is not amenable to single-sector solutions. Sustainability involves a large, complex and dynamic set of interactions with multiple entry points and trajectories, and should aim at maximising benefits while minimising trade-offs. Underpinning a sustainable agricultural sector transformation is the need of the hour for upscaling integrated innovations, technologies and practices that can build farmers’ capacity to increase productivity and increase their resilience and adaptation to climate change. Innovative, integrated and cross-sectoral sustainable agriculture approaches can help increase tree cover, improve food security and sustainability. 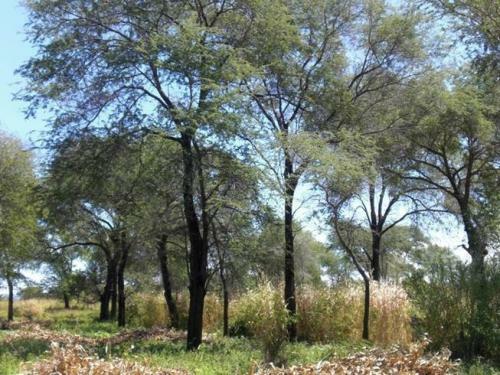 Policy and governance mechanisms backed by good practices and technologies are needed to integrate and manage trees on Africa’s agricultural landscapes to address hunger, reduce the impact of climate change and reverse environmental degradation.